Handwriting is what registers our individuality, and the mark which our culture has made on us. It has been seen as the unknowing key to our souls and our innermost nature. It has been regarded as a sign of our health as a society, of our intelligence, and as an object of simplicity, grace, fantasy and beauty in its own right. 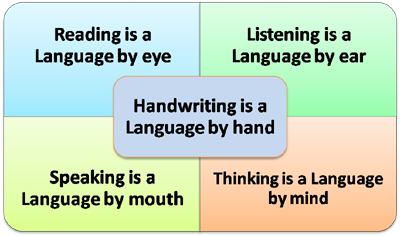 Recent research illustrates how writing by hand engages the brain in learning. During one study at Indiana University published this year, researchers invited children to man a "spaceship," actually an MRI machine using a specialized scan called "functional" MRI that spots neural activity in the brain. The kids were shown letters before and after receiving different letter-learning instruction. In children who had practiced printing by hand, the neural activity was far more enhanced and "adult-like" than in those who had simply looked at letters. "It seems there is something really important about manually manipulating and drawing out two-dimensional things we see all the time," says Karin Harman James, assistant professor of psychology and neuroscience at Indiana University who led the study. "Make no mistake, if handwriting has a poor appearance, the writer is judged poorly by our culture. This won't end tomorrow. Surface features will always attract far more attention than underlying structures. For a person who has poor handwriting, the road ahead is difficult. In spite of the high quality of his ideas and information, the writer will bear a lifelong burden. But such a fate is unnecessary...for those who know how writers develop their skill in handwriting." -- Donald Graves, "A Fresh Look at Writing"